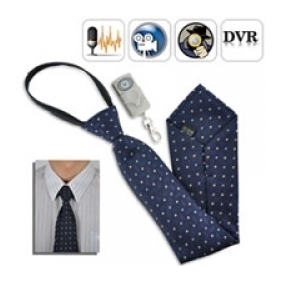 It may be an innocent looking tie, but it secretly houses a 4GB DVR kit with a built-in high capacity 500mA rechargeable polymer Li-battery, and can be triggered to record as far as 10 meters away using a wireless key chain remote controller. With its perfectly hidden pin hole camera, this Spy Gadget can record up to 3 hours per single recharge, there by allowing you record dozens of video clips with out having to worry about battery power. This Spy Camera Tie with Wireless Remote surveillance gadget is perfect for Journalists on assignments, sting operations, Law enforcement, private investigators, you name it. It’s perfect for everyone! This DVR spy tie gadget is a plug and play device, meaning once you've finished recording, all you have to do is open the secrete compartment within the tie from the back side, and insert it into any USB port on your laptop or computer. Then, enjoy watching those easy earned surveillance recordings. 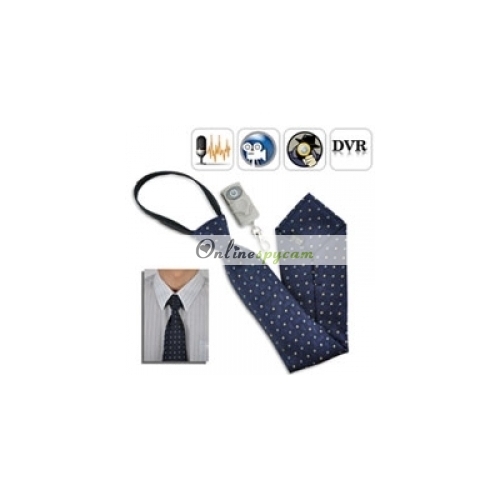 This tie DVR spy gadget is easy to operate, it comes with an easy-to-use toggle on/off master switch, so when you're ready to record, just press the remote button for 2 seconds and the LED will indicate that the DVR within the Ties has started recording. Then flip the Tie over (the LED indicator light is on the backside) and you're ready to go! * Supported OS: Windows 98/ ME/ 2000/ XP/ 2003/ VISTA / MACOS / linux.